"When I was 14 years old in junior high school, I volunteered for a first aid corps that served the underprivileged in rural areas. That was my first CPR and First Aid course. And then I became a Healthcare Provider and re-took the course every two years or so. When my mother died of sudden cardiac arrest, She was very young and healthy. I was not with her at that time. I pictured myself next to her and felt helpless! I was not sure, how to put my knowledge in to a act! Not only that, I was also troubled by the fact that those around her weren’t able to intervene. It became my dream to spread CPR education to as many people as possible. That dream started to take shape when I educated my self more and became an American Heart Association instructor. At first, I volunteered teaching for Beverly Hills CPR and then slowly I started teaching part time. Shortly after A Plus CPR 4 Less was born and has grown over the years. 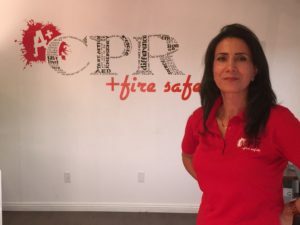 We are a business passionate about excellence in CPR training."